The French composer Benjamin Godard is best known for the Berceuse from his opera Jocelyn, and despite him being a prolific composer few works of his are in the catalogue. This new recording of his 1890 opera Dante from Palazzetto Bru Zane on Ediciones Singulares provides welcome opportunity for re-assessment. Ulf Schirmer conducts the Münchner Rundfunkorchester, Chor des Bayerischen Rundfunks, Edgaras Montvidas, Veronique Gens, Jean-Francois Lapointe, Rachel Frenkel, Andrew Foster-Williams, Diana Axentii and Andrew Lepri Meyer. 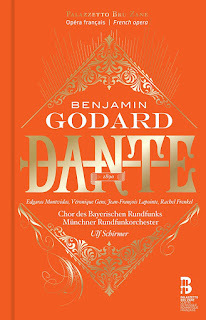 Benjamin Godard studied at the Paris Conservatoire with Napoléon Henri Reber, Massenet's teacher, and listening to Godard's music on this disc you can hear links with Massenet (born seven years earlier than Godard) and the plot of Dante has links to that of Massenet's Werther (premiered two years after Dante), perhaps because librettist Edouard Blau worked on both operas. But there are important differences between the music of Godard's opera and that of Massenet. Godard disapproved of Wagner, both the man (Godard was of Jewish origins) and the music. Godard's music relies on that of a pre-Wagnerian era so it lacks the harmonic sophistication and richness of Massenet's music. It is rather easy to play spot the influence in Godard's music, and it does have rather an old-fashioned cast; it is difficult to quite believe that Dante premiered just 12 years before Debussy's Pelleas et Melisande. But Dante is a well-made piece and Godard's handling of the orchestra, in his own way, is very notable; one of his major works was the dramatic symphony Tasso and it is this symphonic handling which is significant in Dante. The plot is, frankly, a bit of a farago. It takes the historical Dante (Edgaras Montvidas) and Beatrice (Veronique Gens) and creates something of a love triangle with Bardi (Jean-Francois Lapointe), so that Dante and Beatrice love each other but there are political reasons why they cannot marry and she is betrothed to Dante. The rather slow first two acts set the scenes, and act two ends with Dante and Beatrice pledging their love in a glorious love duet, before Dante is banished from Florence. In Act Three he goes to the tomb of Virgil and prays for inspiration, then in a dream sees Virgil (Andrew Foster Williams) arise from his tomb and present visions of Hell and Paradise, culminaating in an ecstatic vision of Beatrice. In the last act Beatrice is dying in a convent, the two men are reconciled and she has an ecstatic and visionary death with Dante vowing to write his masterpiece inspired by Beatrice. Edouard Blau's libretto is not very strong in character and background. Essentially Dante is an ardent poet, and Edgaras Montvidas sings with strong, ardent virile tone, though he sometimes pushes too much and I rather missed the sort of lithe, incisive yet elegant tone which was a characteristic of many French tenors in the past. By contrast, Beatrice is a rather passive character who seems to come alive when Dante is there. Veronique Gens sings her very finely, but it is in the duets with Edgaras Montvidas where the characters come alive. Jean-Francois Lapointe does his best with Bardi, but the volte face between Acts Two and Four remains unconvincing. The most striking part of the opera is the Virgilian vision and this is probably closest to the Godard of the dramatic symphony, you rather wish it was longer and the maudlin final scene shorter. 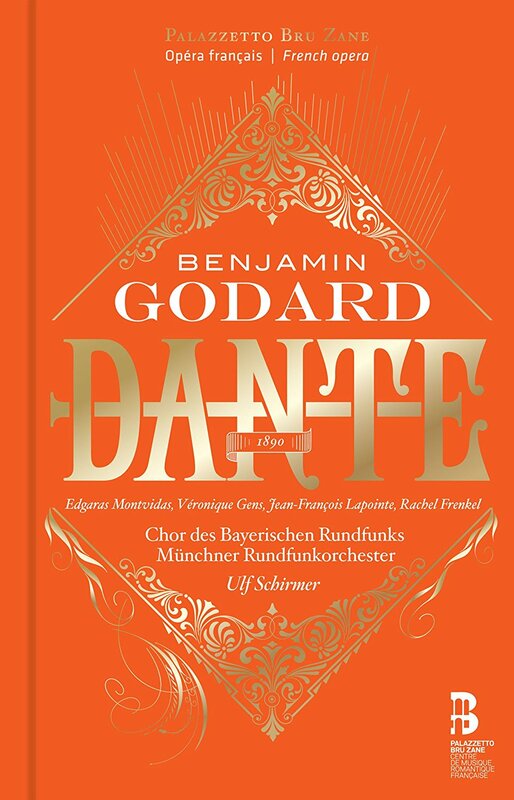 Ulf Schirmer draws fine singing and playing from the Munich choir and orchestra, and the vibrantly support Benjamin Godard's rather distinctive, if old-fashioned, operatic vision. All concerned sing this well made opera with conviction and ardency, I cannot imagine better champions and this set represents a valuable insight into the varied operatic styles current in late-19th century Paris. The discs come with one of Palazzetto Bru Zane's valuable books (in French and English) with period illustrations, valuable background reading and a complete libretto.